Distracted Driving: Is It Becoming More Dangerous? Near-accidents happen around us all the time; unfortunately, a lot of bad accidents are caused by distracted driving. Many states have enacted a “no texting” law, but many still have not. Sadly, it is not uncommon in many areas to see a driver looking down at their phone while driving. These accidents are 100-percent preventable. In many states, laws have been passed to try and stop texting while driving. And in some states it is illegal to use your phone, period. These laws are in place to curb the use of cell phones while driving. They are tough laws to enforce, but many states are making the penalties steeper than ever. It is illegal to hold your phone and use the speaker function. 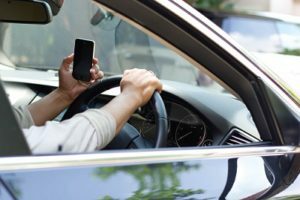 Many times you will see drivers do this, but it is also considered distracted driving, and anyone causing such an accident may be held criminally liable. If you are stopped for using your phone while driving, the penalties are steep. A fine can run anywhere from $50-$300. Local jurisdictions set the fines for such traffic violations. In some instances, such a violation will be permanently on your driving record. Among other things, your insurance rates will increase. If you are in a car accident, whether or not it involves distracted driving, make sure to speak with an attorney to learn your options. Generally, there is a two-year statute of limitations in which to file your claim with the courts. Since the early laws were written about texting and driving, our cars have gotten much more sophisticated. There are many devices in a car that can distract you, from the GPS, to Siri, to texts and emails on the screens that are now in most automobiles.